Season 3, Episode 54 - Amy Hunter Dan Sterenchuk and Tommy Estlund are honored to have as our guest, Amy Hunter. Amy Hunter is the Manager of Diversity and Inclusion for St. Louis Children’s Hospital. She recently joined the organization after being the Director of Racial Justice for the St. Louis YWCA. Currently, she is charged with addressing internal and external health equity issues. Hunter has years of experience in the corporate, education, and nonprofit community. Her alliance and community building placed her in the unique position of credibility with the young people driving the demand for change, their elders in the civil rights movement, and even the "establishment". She was extremely active in the wake of the death of Michael Brown, the unrest in Ferguson, and the exposure of municipal and governmental impropriety. She is known for “The Talk” which was incorporated in her TEDx Talk “Lucky Zip Codes”. She is published and has been seen on ABC, CNN, NBC and a host of other networks and heard on NPR and other media outlets. 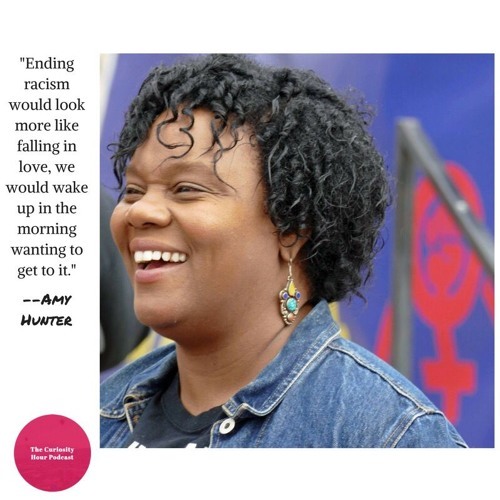 Amy has three sons and a daughter and currently is working on her Ph.D. in the field of critical race theory. The Curiosity Hour Podcast is hosted and produced by Dan Sterenchuk and Tommy Estlund. Please visit our website for more information: thecuriosityhourpodcast.com Please visit this page for information where you can listen to our podcast: thecuriosityhourpodcast.com/listen/ If you would like to share your story or have a suggested guest, please complete the "Contact us" form: thecuriosityhourpodcast.com/contact-us/ Disclaimers: The Curiosity Hour Podcast may contain content not suitable for all audiences. Listener discretion advised. The views and opinions expressed by the guests on this podcast are solely those of the guest(s). These views and opinions do not necessarily represent those of The Curiosity Hour Podcast. This podcast may contain explicit language.